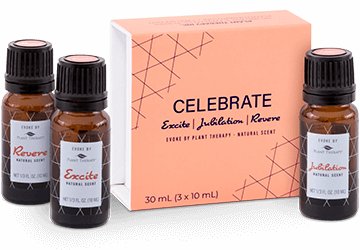 Evoke by Plant Therapy is our new line of natural fragrance products, characterized by their complex, emotive scents, derived from the natural aromatic components of essential oils. Bring the emotion of fragrance into your life with Evoke. Your senses will flourish when you experience the blends in our Thrive Set. Influenced by vintage spirits, this collection is spicy, woody, and fresh, with undertones of warm sweetness that will inspire you to thrive. Different scents evoke different feelings - the excitement you feel before a big date, the joy you feel when you realize a goal, the admiration and love you feel for your family. All of these emotions have been captured in our Celebrate Set.